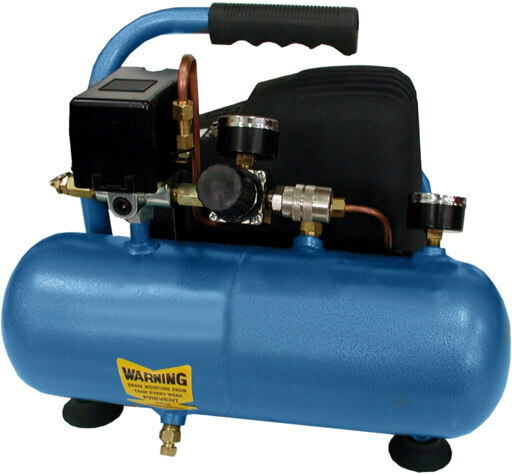 Air Compressors can be considered a basic need for a lot of businesses, and even homeowners can find practical and convenient uses for them. An air compressor is more than a tool to inflate your car’s tires, it should be looked at as an alternative power source for your shop or garage. Typical compressors come in 1 or 2-cylinder versions to suit the requirements of the tools they power. On the homeowner/contractor level, most of the 2-cylinder models operate just like single-cylinder versions, except that there are two strokes per revolution instead of one. Some commercial 2-cylinder compressors are 2-stage compressors–one piston pumps air into a second cylinder that further increases pressure. Air compressors use a pressure switch to stop the motor when tank pressure reaches a preset limit–about 125 psi for many single-stage models. Most of the time, you don't need that much pressure. Therefore, the air line will include a regulator that you set to match the pressure requirements of the tool you're using. A gauge before the regulator monitors tank pressure and a gauge after the regulator monitors air-line pressure. In addition, the tank has a safety valve that opens if the pressure switch malfunctions. The pressure switch may also incorporate an unloader valve that reduces tank pressure when the compressor is turned off. The cfm (cubic feet per minute) and psi (pounds per square inch) ratings are important because they indicate the tools that a particular compressor can drive. When choosing a compressor, make sure it can supply the amount of air and the pressure that your tools need. More sizes and configurations available, if you do not see what you need here, please call us to find your best fit. A homeowner’s choice, narrow design and Good Power. Maximum Capacity with a Vertical and Portable Design. Less expensive alternative to metal enclosures or walls. These acoustic sound curtains are portable and can reduce up to 47 decibel levels and allow for an effective way to partition workspace.